This is not a new color or a high-end brand, but as I've read through many of my favorite beauty blogs in the last few weeks I have noticed that not many of the drugstore colors that I have loved for years are mentioned. Many of us are aware that brands such as MAC and Urban Decay come out with "the next best thing" every season, but what about the tried and true colors that women have been using for years? Revlon's lipstick in Coffee Bean is one of those colors. I started using this in high school and it soon became one of my two drugstore-brand staples (the other I will address in another post because it deserves its own page). Coffee Bean was even discontinued at one point, but disgruntled women of all ages managed to bring it back. This is one of those colors that looks good on the fairest skin tone, as well as the darkest. 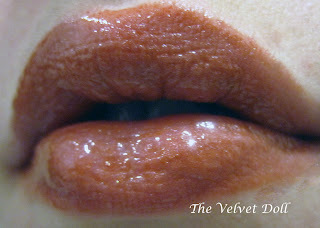 It can look super brown and bold, or with a gloss it can look like your lip color (but better). This lipstick goes on very smoothly and doesn't dry out your lips. I love it with just a lot of lash and some bronzer! 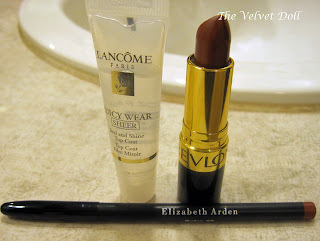 I paired Coffee Bean with Elizabeth Arden lip pencil in Spice and Lancome Juicy Wear in Sheer. This color is so beautiful, and for $7.99 everyone should own Revlon's Coffee Bean! Right now at drugstore.com if you buy one Revlon product you can get another for 1/2 off! You can have two Coffee Bean lipsticks for almost free! I bought this lipstick yesterday! I was at CVS, looking at the Revlon products (it's 'buy one, get one free' this week!) and I remembered this post. I just applied it on for the first time and I love it! You look very seductive ! Love it !